Your body is busy making and creating a tiny human being - Your body is amazing! Embrace your pregnancy glow with a maternity portrait session. 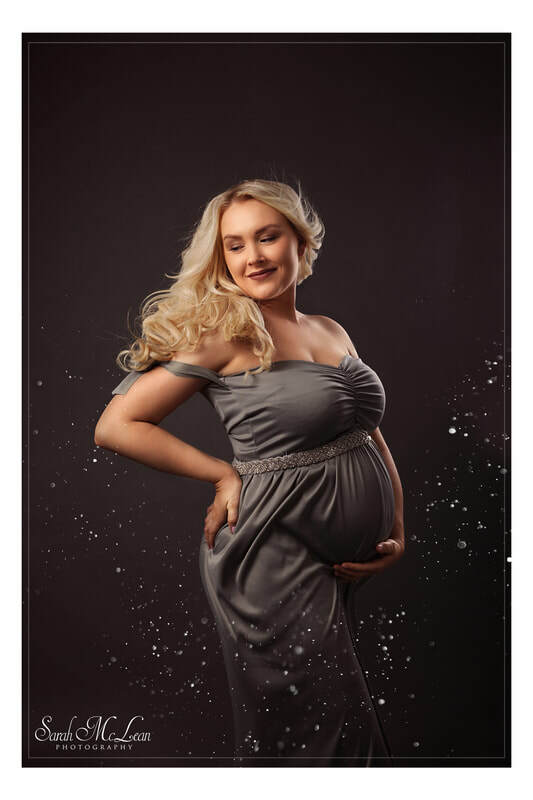 Choose a stunning dress or luxury scarf to wear or wrap around you from my ever growing custom made maternity wardrobe for your session. Maternity bump sessions are best scheduled between 28- 34 weeks when your bump looks it's very best, and early enough in case your baby decides they want an earlier birthday as planned. During pregnancy there may be days where you may not feel your very best (pregnancy can make you feel like this). ​It is my job as your photographer to make you look and feel amazing, and years from now you will be happy to made the decision to document this once in a life time event and look back on these pictures with your children in years to come. When you arrive into the studio we will chat over a cuppa about your session, and browse through the selection of dresses, and fabrics available to find the perfect ones for you to use during your session. When you step into the studio, I will guide and direct you throughout your photoshoot, demonstrating all the poses so you can follow them easily. I use clever posing and lighting techniques to flatter your body shape, so you look your very best and professional retouching - as much or as little as you wold like, is included too. (this includes the removal of blemishes and stretch marks if required). With our MONEY BACK GUARANTEE you can have peace of mind throughout your photography experience with me. However if you wish to order just a few images or prints over a package, due to the time involved there is a minimum order fee of £299. £99 non refundable retainer is required in order to secure your booking. This will be deducted from your final order.